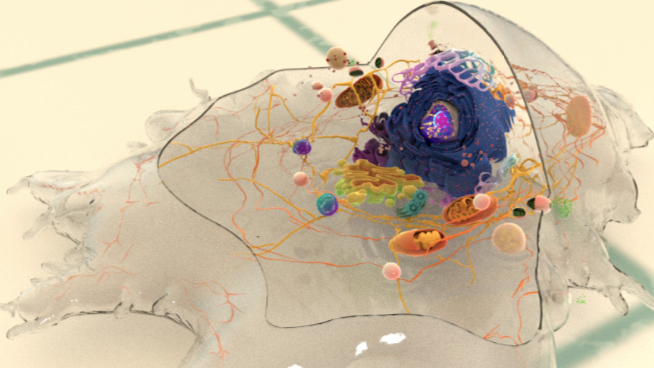 Based on findings from a large number of anatomical, biochemical, and genetic studies carried out over the years, three major theories have been put forth to describe the cellular origin of hematopoietic stem cells. Although these theories are centered on the closely coinciding origination of the endothelial and hematopoietic systems during development, they follow slightly differing ontogenic pathways based on the common ancestral precursor from which they originate. The hemangioblast theory: The theory derives its name from a mesodermal cluster named the hemangioblast, which is proposed to diverge into both endothelial and hematopoietic lineages (Murray PDF, reviewed in ). Initial studies supporting this theory demonstrated how a group of mesodermal cells could bud off from the vascular endothelium to form the primitive blood islands in the yolk sac (Sabin FR, reviewed in ). However, later studies have suggested the formation of an intermediate, bi-potent cell population from the mesodermal clusters that then differentiate into endothelial and blood cell lineages within the yolk sac. The simultaneous origination of the two lineages proposed in this theory were later supported by analyzing the gene expression profiles of the two cell types, which reported the shared expression of a number of cell surface markers, such as Flk-1 and VE-cadherin , as well as transcription factors, such as Runx1 and Gata-2 . Despite a large number of studies supporting the existence of the hemangioblast, this theory is only thought to be relevant to the primitive hematopoiesis phase. 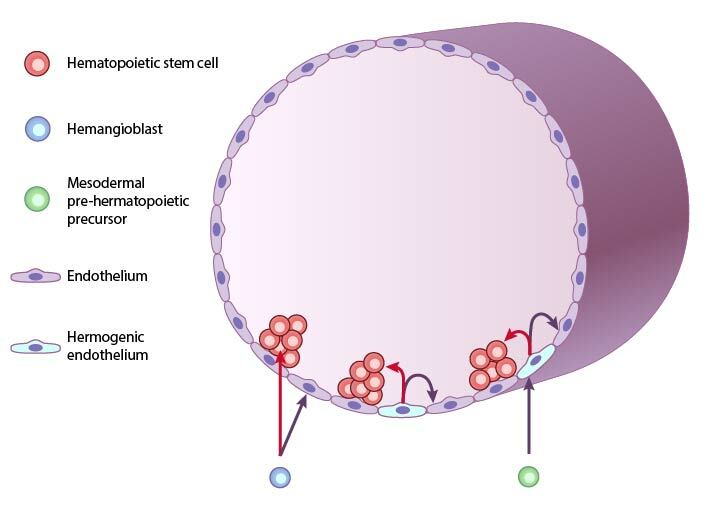 The hemogenic endothelium theory: This theory is more pertinent to the definitive hematopoiesis phase and proposes that the HSCs directly originate from a specialized vascular endothelium located in the AGM region, called the hemogenic endothelium. The earliest evidence for the existence of a specialized endothelium came from fate mapping studies using chick and mice embryos, in which endothelial cells were labeled with a marker before the onset of hematopoiesis. These markers were subsequently expressed in the hematopoietic precursors that emerged later on, suggesting that the endothelium is the ancestor for the origination of the blood-forming tissue . Concurrent with these findings, culture assays using embryonic endothelial cells confirmed the ability of these cells to differentiate into both lymphoid and myeloid progenitor cells . Similar studies were carried out using human embryonic CD34+ endothelial cells harvested from the AGM. These cells were cultured on a stromal layer to induce multi-lineage hematopoiesis, and they confirmed the existence of a hemogenic endothelium since the frequency of the endothelial cells in the AGM correlated with the extent of hematopoiesis in vitro . The mesodermal prehematopoietic precursor theory: This theory has emerged as a combination of the hemangioblast and the hemogenic endothelial theories of hematopoiesis, and posits that both these events can happen at the same time as sequential steps of a common ontogenic pathway. According to this theory, which is based on findings from mouse embryonic stem cell differentiation studies, the hemangioblast gives rise to the hemogenic endothelium, from which the hematopoietic cells are then derived . This concept has been supported by genetic studies, which showed Runx1 (a transcription factor that promotes hematopoiesis) expression in both the aortic endothelium and the ventral sub aortic mesodermal cells  as well as by fate mapping experiments in mice embryos that confirmed the emergence of HSCs from the hemogenic endothelium lining the ventral wall of the aorta, which was in turn derived from an early mesodermal cell cluster . Endothelial-hematopoietic transition: The emergence of the HSCs from the hemogenic endothelium is reliant on an important cellular event called endothelial-hematopoietic transition (EHT). Endothelial cells undergo a series of phenotypic and genetic alterations as they shed off from the aortic wall into the sub aortic space. During this process, endothelial cells from the aortic floor repeatedly contract and bend towards the sub aortic space, and as they do so, they gradually lose contact with their neighboring endothelial cells, round up, and attain oscillatory motion along the aortic vessel’s axis. Eventually, the cells completely delaminate from the aortic endothelial walls and move freely into the sub aortic space, at which stage they have morphological features resembling hematopoietic progenitor cells . These events were first visualized using live imaging techniques in Zebrafish embryos, and similar cellular transitions have also been observed by live imaging of cultured organotypic slices of the mouse AGM region .